﻿Picture ﻿Name ﻿Description ﻿Part # ﻿Distributor ﻿Qty. Place the PCB in a good board holder. In v1.1 two components have been added, C1 and C2. 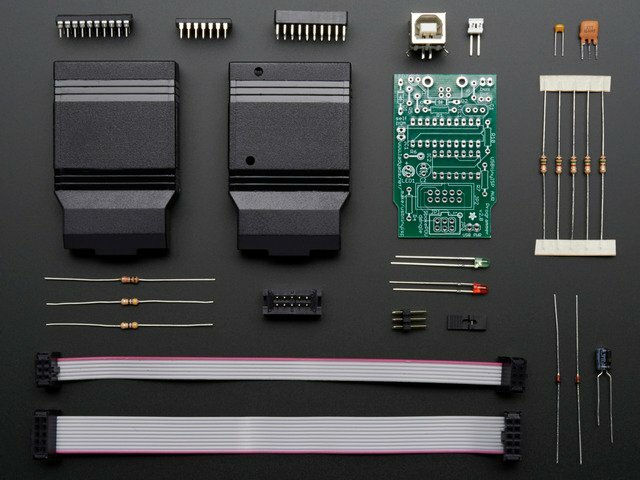 These parts add power supply stability! Start by inserting C2 by bending the legs and placing it in the circuit board. C2 is a polarized capacitor.This means it should be soldered in a certain way and if you put it in backwards it can be damaged or even explode! If you look carefully you will see a bump on one end of the capacitor, and on the circuit board the printed image also has a bump. Check the photo if you are not sure. Next, insert C1, which is a non-polarized capacitor; it can go in either way. Bend the wire legs of the capacitors and turn the PCB over in the vice. Now you can solder the parts in. Use your trusty soldering iron to solder each of the 4 wires to the round pads. Use diagonal cutters to clip the excess wire, cut close to the end of the solder point. Place the 4 battery clips in the top two battery positions, as shown. Tack them in place with solder so that when you turn the board over they won't fall out! Now turn the board over and solder the outer tabs of the clips first and then resolder the inner tabs. Make sure there's plenty of solder: these connections are not just electrical, they're mechanical too! Solder in the smaller socket just like the larger one. Place the 6 top 74HC595 latches in the proper spots, making sure to align the notches on the chip with the notches in the pictures. Tack them in place by soldering two corner pins of each one from the top. Then turn the board over and solder all the pins. LEDs are diodes, that means they only work in one direction, unlike resistors. That means you must put the LED in right or it won't work! How do you know which way is which? That's easy, the LEDs have one leg that is slightly longer! That leg is the "anode" positive leg. The shorter one is the "cathode" negative lead. When you place each LED, bend the leads out so that it won't fall out when you turn the board over. Repeat for the other row of LEDs. On this side of the kit (with the battery connectors as shown on the left) - the longer leg of the LED goes in the hole along the edge of the PCB. Put the microcontroller in the socket so that the notches match up. The sensor can 'lean' on the microcontroller. If you want, you can use a bit of glue to support it. Place the EEPROM in the smaller socket so that the notches line up. You're done! Now that you're done assembling it, you can test the board to make sure it's functioning. Put two (or three) good AA batteries into the clips. Whenever the microcontroller gets notice of a 'hard reset' it goes through a little test routine where it lights up all the LEDs in order, then it lights up one LED on each side of the SpokePOV to indicate that it's still on. The actual LED itself will vary as it is used for debugging. If none of the LEDs are lighting up, go back and check to see if you put in any latches, batteries or the microcontroller in backwards. If just a few LEDs arent lighting up, check if they're in backwards. SpokePOVs now come pre-programmed with some sample images. You can trigger the images using a magnet, sweep it past the sensor a few times and then wave it in the air, you should see a pattern displayed. Can't get it working? Don't worry, help is available in the forums! This guide was first published on Apr 17, 2014. It was last updated on Apr 17, 2014. This page (SpokePOV) was last updated on Apr 20, 2019.